DVD Digital Video Disc, Digital Versatile Disc –is a standard of data save on an optical carrier, similar to CD-ROM (the same dimensions: 12 or 8 cm) but of the larger capacity that is obtained with the increased density of a record. DVDs may be divided into these only to readout: DVD-ROM and those enabling record on a disc: DVD-R, DVD-R DL DVD-RW, DVD+R, DVD+R DL, DVD+RW DVD-RAM. The name DVD is an abbreviation of the informal name Digital Video Disc. A later explanation of this abbreviation was defined Digital Versatile Disc. None of these names has ever had an official status. The only official name is just DVD. The inventors created the DVD format for the digital record of video materials. However, the growing demand of the IT industry for the higher capacity carriers made the DVD format of general purpose. Thanks to the laser beam with the shorter length of wave placing the larger amount of the more densely compressed tracks on the discs of the same size as a standard CD. What is more, the DVD discs have two lined up layers to record. In 1994, many companies started to look for a new technology, which would enable improving of a compact disc. In this period, two different projects were created. Toshiba that offered the increasing density of record and the use of the both sides of the existing optical discs made one of them. This way SD (Super Density) discs were created. The leaders of the other group were two giants of CD market, i.e. Philips and Sony. Their solution was called MMCD (Multi Media CD) and it assumed a creation of two or more layers on one side of a disc, and the data were to be read with the laser beam of variable wavelength. Such state didn’t last long, though. At the end of 1994 the companies agreed to combine their technical inventions in order to avoid the promoting of two various formats. At first, an application of the new carrier was the film industry, as maximum capacity 17GB enabled recording 481 minutes in MPEG-2 format with three audio tracks. It turned out soon that the large capacity offered by DVDs is excellent for its industry, too. That is why, the first name Digital Video Disc associated with the discs that contain only films, was replaced with name: Digital Versatile Disc. 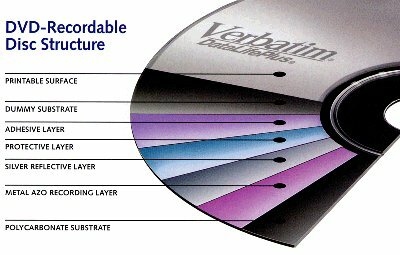 DVDs are made form polycarbonate. The disc that is made from it is round, has 12 cm in diameter and 1.2mm thick. On the polycarbonate surface there is aluminum. On this surface the information is recorded that is then read with the optical laser, which is distinquished with the wavelength of 780 nanometers. The data on the disc are recorded from its inside to the outside . That is why, the rate of the rotation decreases during the reading. Information recorded on the disc has the form of pits. Between the pits there are surfaces without pits that are called the lands. 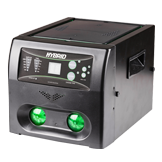 Because of the material used, CDs and DVDs get damaged and scratched easily. That leads to the reading problems. 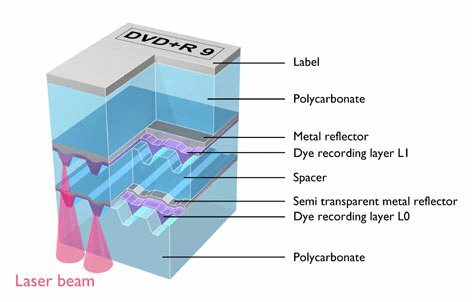 As the protective layer on the DVD is significantly thinner than in case of CD, then we are able to repair DVD fewer times than CD. A bottom layer is translucent. The laser beam may read information recorded both on the lower and upper layer depending on the wavelength and the inclination angle. Another change in comparison with CD is the possibility of using DVDs with the double-sided record. In contrast to CD, DVD has to contain a system of files. The system of the files used on DVD is called UDF, which is an extension of ISO 9660 standard that is used in data recording on CDs. In order to increase the profits, distributors implemented protections in the form of dividing of the world into regions. The data on DVDs are recorded in the same way as the data on CDs, i.e. on a single spiral track. The information has the form of small pits on the mirror surface of a disc. If the laser ray finds an area between the pits (which is called a land) during reading of the data, it is reflected. However, if the laser finds pit, then such variation occurs that it doesn’t come to a special phototransistor, which is a signal’s receiver. That is why; particular areas are identified as bits of value 1 or 0. The basic difference between CDs and DVDs is the density of data packing on a disc. DVD has such increased density that one side of a single-layer disc can record more than seven times more information than traditional CD. Such increasing of the record density created requirement to use the lasers of the shorter wavelength to read. So, in the standard CD-ROM drive the infrared lasers are used (wavelength is 780 nanometers), whereas in DVD drives the red lasers are used with wavelength of 640 nanometers. Reading of the data from the double-layer discs looks even more interesting. The surface of upper layer of a carrier is translucent, which enables reading from both layers of the same disc with the same optical system that is appropriately focused. The data reading in case of the double-layer discs may be conducted in two different ways- either data from bottom layer are read with data from the upper layer (in order to achieve it continuous change of focal length of laser ray is required) or the head of reading apparatus first reads the data from one track (wandering from the inside to the outside of the disc) and then from another one that is located on the other layer (then the head moves from the outside to the inside of the disc). Such solution enables reading of video without unwanted breaks from both layers of a disc.